Most Texans support carrying guns in public, but only a minority supports carrying them openly, whether the carriers are licensed or not, according to the University of Texas/Texas Tribune Poll. Most Texas voters support the right to carry guns in public, but a large majority would not allow open carry of those weapons with or without licenses, according to the latest University of Texas/Texas Tribune Poll. Almost a quarter said Texans should never be allowed to carry handguns in public, and only 10 percent said they should always be allowed with no license required. The majority fell in between: 45 percent would allow concealed handguns in public if the carriers were licensed, and another 22 percent would allow those with licenses to carry handguns openly. 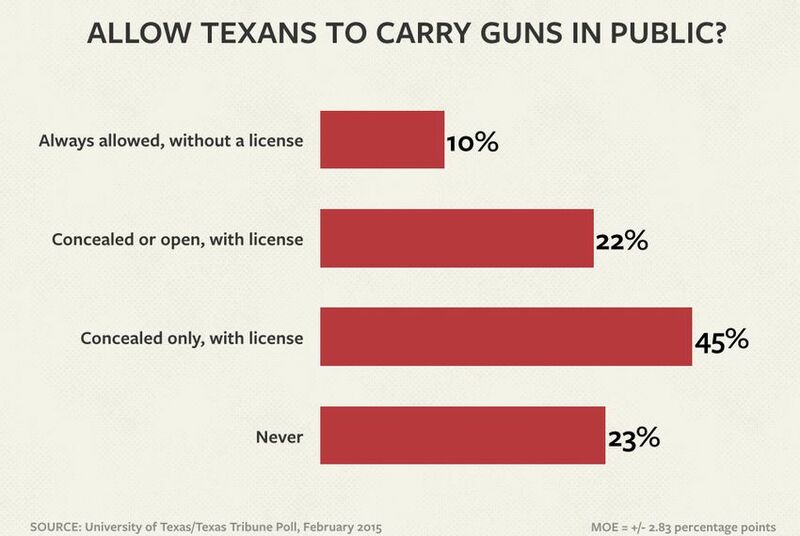 Put another way, 32 percent of Texans would allow open carry — some with a license, some without — while the rest would prefer no legal handguns in public or to leave in place the state’s current law, which allows licensed carry of concealed handguns. There is a strong partisan twist to the numbers: 30 percent of voters who identify with the Tea Party said Texans should always be allowed to carry without permits, while the “never be allowed” option barely registered with them. Among Republicans, 6 percent said always and 12 percent said never. Among Democrats, 45 percent said never and only 2 percent said always. For each of the three groups, more than half would allow public carry of handguns with permits. Among Republicans and Democrats, “concealed” was the clearly preferred option. Tea Party voters were slightly more likely to say they would allow open carry in addition to concealed carry, and were the only group with a majority in favor of open carry, either with or without permits. Voters are split when it comes to allowing concealed handguns on state college and university campuses, with 47 percent saying they support guaranteeing the right of faculty, staff and students to carry weapons and 45 percent saying they oppose it. And while 22 percent strongly support the proposal, 32 percent strongly oppose it. 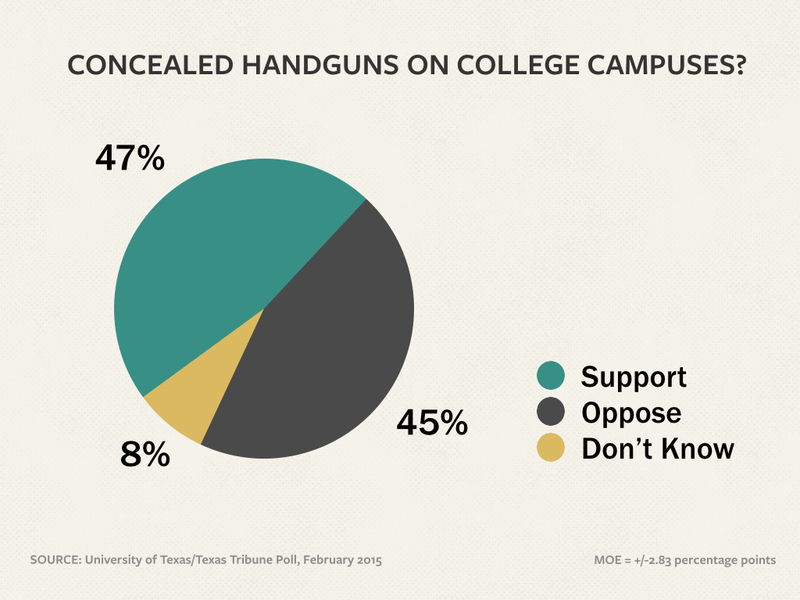 Men were much more likely to support campus carry, with 55 percent in favor and 39 percent against. Female voters opposed it 51 percent to 39 percent. In fact, 36 percent of the voters surveyed said the state’s gun control laws should be stricter than they are now, while 22 percent said they should be less strict and 36 percent said they should be left as they are now. “Texas as it stands right now is a pretty pro-guns state, and even though open carry may seem to be an anomaly, you still see Texans fairly comfortable with the status quo,” Henson said. 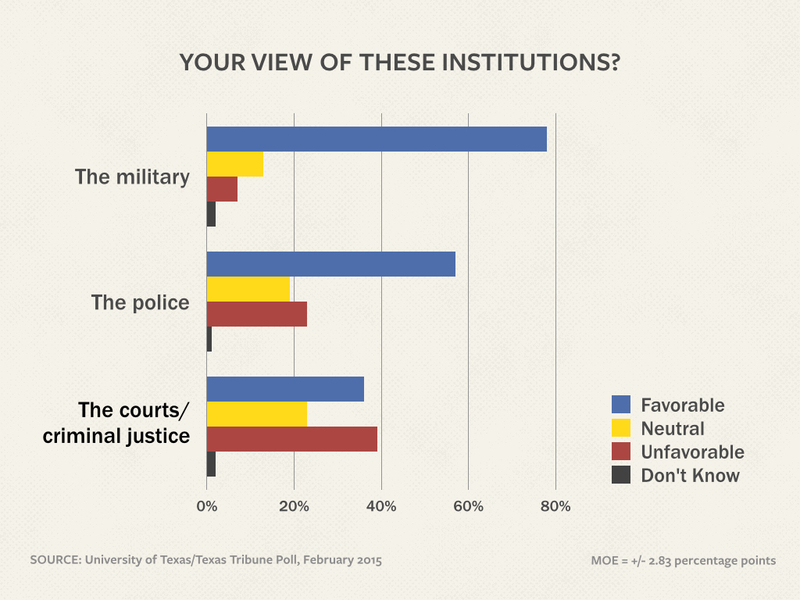 Texans hold the police in high esteem and have even higher regard for the military, according to the UT/TT Poll. But they are much less taken with the courts and the criminal justice system. Seventy-eight percent have favorable views of the military, while only 7 percent have unfavorable views. More than half of those voters said they have a “very favorable” view of the military. The police, as an institution, are viewed favorably by 57 percent and unfavorably by 23 percent. In contrast, 36 percent said they have a favorable view of the courts and the criminal justice system, while 39 percent said they have an unfavorable opinion. Almost a quarter of Texans said marijuana possession should never be legal in the state. But 34 percent would allow it for medical use, 26 percent would allow possession of small amounts “for any purpose,” and 16 percent would allow any amount for any purpose. Texans remain strongly in favor of the death penalty for criminals who commit violent crimes: 75 percent support that punishment, including 49 percent who strongly support it. Only 19 percent oppose it, including 9 percent who strongly oppose it. This is one of several stories on the latest University of Texas/Texas Tribune Poll. Yesterday: Presidential primaries and the mood of the state. Tomorrow: What voters say about taxes and transportation.